1080p/60Hz up to 330 feet (100 meters) away from your HDMI or DVI-D source using one CAT5e/6 cable. to supply the power both the end of the Sender and Receiver. 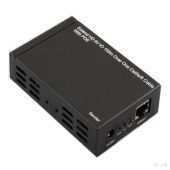 Enables HDMI 10.2Gbps over a single100mCat5e/6 cable. sending IR commands received in the vicinity of the Display back to the Source devices.